LOW SODIUM;GOOD SOURCE OF DIETARY FIBER - Contains 8g of total fat per serving. This Breakfast Blend contains a mix of sweet and crunchy breakfast favorites combined to give your day a proper head start. 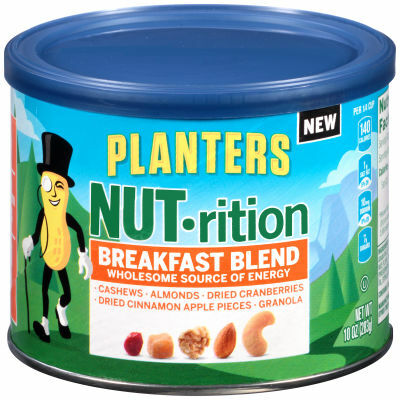 Enjoy the cashews, almonds, dried cranberries, dried cinnamon apple pieces and granola in every bite. A wholesome source of energy, this blend of fruits, nuts and granola satisfies your morning cravings Snack on it throughout the day if you feel yourself wanting more! This mix is available in a resealable 10 oz. canister to keep each ingredient fresh. Serving size 1/4 cup (30g).